Mrs Gulcin Ozdemir is a 35?year?old mother of four children aged 7 years, 5 years, 3 years, and 18 months. Gulcin arrived from the Groeme Valley in Turkey with her husband Ergun 9 years ago, leaving behind her parents and siblings. 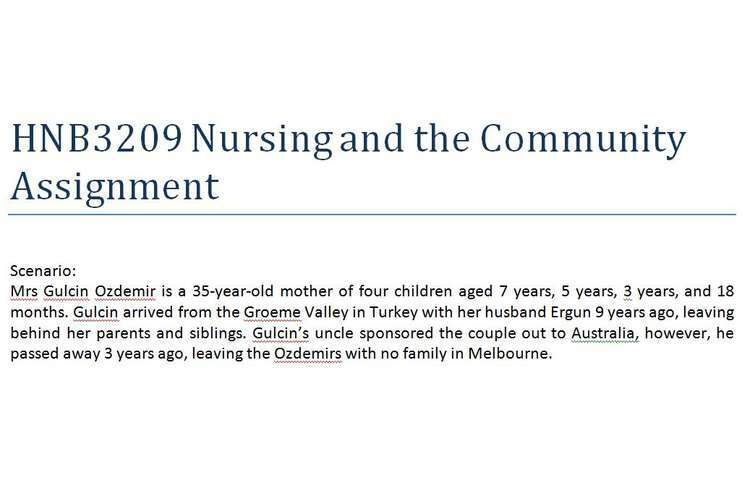 Gulcin’s uncle sponsored the couple out to Australia, however, he passed away 3 years ago, leaving the Ozdemirs with no family in Melbourne. The Ozdemirs live in a rented 3?bedroom, single?storey house with a small garden, in the western suburbs of Melbourne. Ergun drives a truck for a living – he has always driven haulage trucks. Before the children came along, Gulcin would climb into the front seat of the cab and go on some of the country and interstate trips with him. Gulcin takes pride in running her home and looking after children. She enjoys cooking, particularly the traditional recipes from her homeland. She brings in a small income from making lampshades, which she does on a small machine in the sitting room at home. Gulcin misses her parents, brothers and sisters, and hopes to one day have saved enough money to be able to visit her family in Turkey. Gulcin does not have a car licence and finds it a struggle to use the local transport network to get around. She loves to shop and tries to go out almost every day to get fresh produce for her cooking, taking her 3 youngest children with her. However, Gulcin finds it tiring to get about these days. Gulcin went to see her general practitioner (GP), Simon Cross, around 6 years ago because she had been feeling exhausted and drained of energy. Some weeks later, after a number of tests, Gulcin was informed that she has Type 2 Diabetes Mellitus. Some days Gulcin feels unwell, week and tired; other days are better. She feels her main problems are the tiredness – sometimes feeling “under the weather”, and she is also worried by her “waterworks” as she calls it. Gulcin has recently experienced some urinary incontinence but didn’t say anything to her GP; she feels embarrassed and awkward about discussing such private and personal matters. Exercise is difficult for Gulcin, especially on hot days when she can feel particularly weak. She is also afraid she will have more “waterworks accidents” as her problem worsens when she moves about so, she now tends to stay at home more, gluing her lampshades and saving money for her trip back to Turkey. Recently Gulcin’s weight has started to increase, making her feel even more uncomfortable and tired. Gulcin doesn’t speak much English – just enough to get by at the shops. She is finding life quite lonely. She holds on to her dream of seeing her family in Turkey again. “The tablets they are giving me will cure me soon” she says as she smiles. You are a district nurse assigned to coordinate care for Mrs Gulcin Ozdemir (see scenario) and you have several tasks to attend to. You need to identify Gulcin Ozdemir’s health determinants (using the Canadian Determinants of Health model as per below) and her health needs. After that, you need to plan how to best support this client in the community in order to restore her health to the optimum level. Your discussion must be based in the latest evidence. Understanding health (3rd edn.). South Melbourne: Oxford University Press.